Newer built log home on a secluded wooded creek-side setting. Only 6.1 miles (13 minutes) from Holiday Valley and 6.9 miles (15 minutes) from Downtown Ellicottville. The cabin has 2 bedrooms (both with King sized beds) and a loft (Queen sized bed and Full sized Futon). Large open great room. Kitchen with an island that flows into the dinning area and overlooks the living area. On the first floor there is a master bedroom with an attached bathroom with a Jacuzzi tub, plus another full bathroom on the main level. The upper level offers a second bedroom plus a full bathroom and a large loft that overlooks the living area. Washer/Dryer in basement. Balconies overlooking the backyard and a lower deck that overlooks the beautiful creek. Nature awaits you here in this location. All linens & towels are provided. Kitchen dishes, pots/pans, cookware, and silverware all provided. Please note, there is a landline phone for your use due to no cellphone coverage at the cabin. Also, satellite internet can have a slow connection at times and should not be used for streaming videos. Please note, the cabin does not have air conditioning. HE detergent only, please bring your own laundry detergent. Satellite Internet (slow connection at times). Not to be used for streaming videos due to limited satellite bandwidth capabilities. DVD player is not Blu-ray. Please note, there is no cable or local TV service at the cabin. Small collection of DVDs, including kid-friendly. A group of us stayed at this cabin for 3 days and 3 nights and greatly enjoyed ourselves. The cabin was extremely cozy and the view behind the cabin was amazing. If you are looking for a really nice place to stay in the Ellicottville, NY area this is the place. 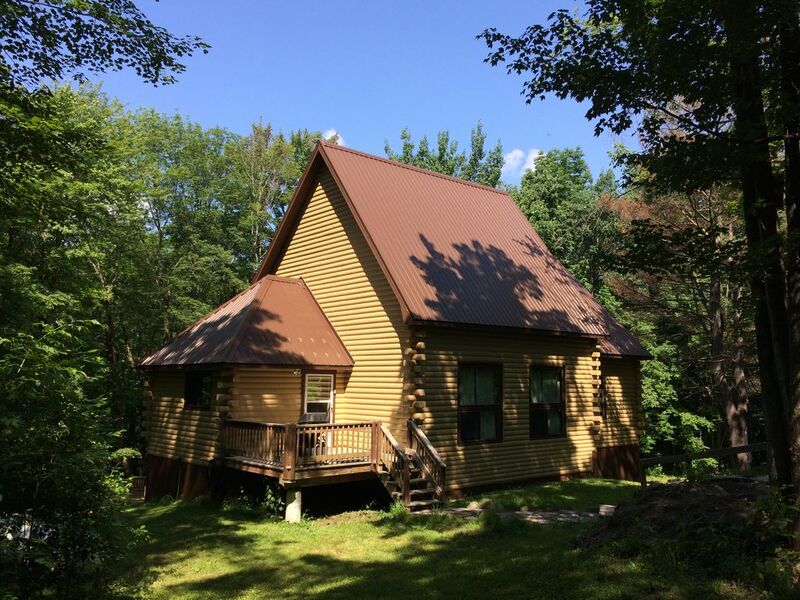 Lovely home less than 10 minutes drive from Holiday Valley and Ellicottville. Close to skiing and town but nicely secluded in hills and overlooking woods and a small brook. Was perfectly sized and located for a long ski weekend getaway for our two families coming from NYC and Cleveland. Kate was also very helpful with our questions before arriving. Thanks so much for a wonderful stay! Great weekend in this cozy log cabin! Great space! Super comfortable and cozy. Great place, close to skiing slopes, wonderful for family time. Has everything you need to relax and unwind. Thank you dear owners! My friends and myself had been planning on this weekend trip for several months -- with the goal of reconnecting as a group of high school friends. Kate was an outstanding help the entire time -- answering questions and helping us through the entire process. The cabin was easy to find, very clean, and provided all the amenities we needed. We had a great time -- being able to enjoy considerable time at the cabin as well as time in Ellicottville. We were close to a golf course, a basketball course, and several restaurants. In fact, from the moment we first entered the property we were planning on returning in the future. This was truly a great experience and a great cabin.